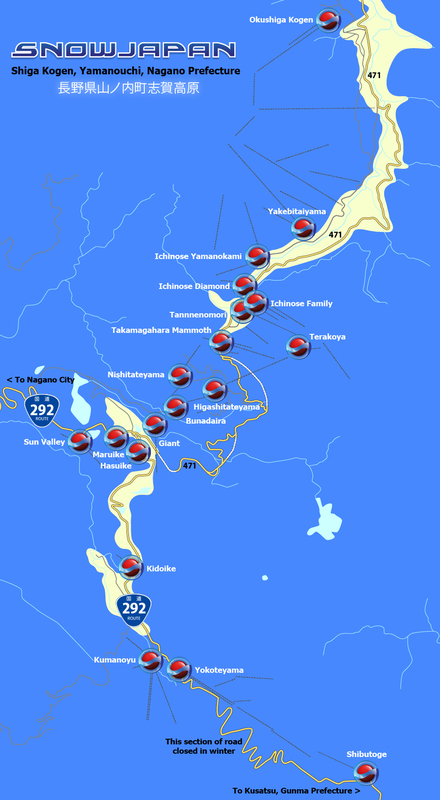 Route 292 passes through the Shiga Kogen area and connects Nagano Prefecture with Gunma Prefecture in the summer months - from late spring until November. Important! During the winter season - usually from late November until late April - the section of Route 292 from the Yokoteyama area of Shiga Kogen through to Kusatsu Town in Gunma Prefecture is closed due to large amounts of snowfall. This leaves Route 292 as the only way to get to Shiga Kogen via road in winter. From the Nakano city and Yamanouchi town area, Route 292 heads up to Shiga Kogen, passing by the popular Jidokudani Monkey Park on the way. Route 292 is a wide and winding road which doubles back on itself a number of times, eventually arriving at the first ski hill of Shiga Kogen called Sun Valley. On a clear day with dry roads it is an easy journey but in mid-winter in snowy and icy conditions it can be much slower, especially if you find yourself behind a struggling large vehicle! The main Hasuike road junction is just 1km further on than Sun Valley. At this point, the choice is to continue straight ahead on Route 292 (signposted as Kusatsu and Kumanoyu Onsen) or turn left onto Prefecture Road 471 (which is signposted as Sakaemura and Nozawa Onsen - though note that you cannot get to Nozawa Onsen using this road during the winter months). The ski and snowboard resorts in Shiga Kogen are accessed either off this main Route 292 or the Prefecture Road 471 road. Information on how to get to the individual resort areas of Shiga Kogen can be found below. Shinshu Nakano IC is the nearest exit on the Joshinetsu Expressway. From the northern Tokyo area, take the Kanetsu Expressway heading north from Nerima IC to Fujioka JCT. At Fujioka JCT turn left onto the Joshinetsu Expressway and head towards Nagano. Exit at the Shinshu Nakano IC. From the Chuo Expressway to the west of the Tokyo region, continue until Okaya JCT. At Okaya JCT head towards Nagano on Nagano Expressway. Continue on the Nagano Expressway until the Koshoku JCT where the road changes into the Joshinetsu Expressway. Exit at the Shinshu Nakano IC. From the Nayoya region, travel east on the Chuo Expressway until you arrive at Okaya JCT. From this point, refer to above. 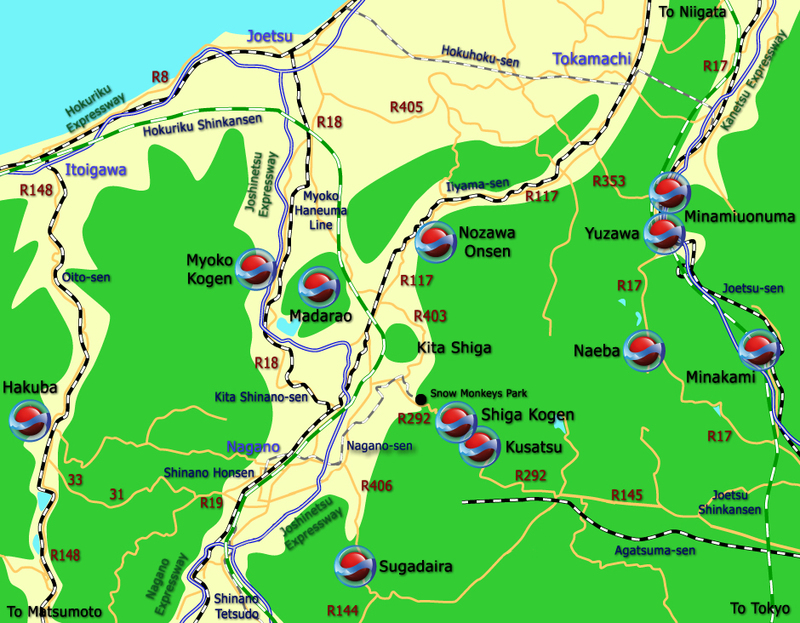 There are two main roads going through the Shiga Kogen area - Route 292 and Prefecture Road 471. At the main Hasuike junction either go straight ahead on Route 292 which is signposted as Kusatsu and Kumanoyu Onsen, or turn left onto Prefecture Road 471 which is signposted as Sakaemura and Nozawa Onsen. Each of the resort areas in Shiga Kogen are well sign-posted. Note that during the winter months, both Route 292 through to/from Gunma Prefecture and Prefecture Road 471 beyond Okushiga Kogen through to Nozawa Onsen are closed. 志賀高原 木戸池 about 27.5km + about 4.5km Follow Route 292 towards Kumanoyu. The small Kidoike is about 4.5km on the left - not connected to other areas. 志賀高原 横手山 about 29.5km + about 6.5km Follow Route 292 towards and past Kumanoyu. 志賀高原 一之瀬ダイヤモンド about 30km + about 7km Turn left onto Prefecture Road 471 after 1km and follow the road. Ichinose Diamond is on the left side. 志賀高原 一之瀬ファミリー about 30km + about 7km Turn left onto Prefecture Road 471 after 1km and follow road. Ichinose Family is on the right side. 志賀高原 一之瀬山の神 about 30km + about 7km Turn left onto Prefecture Road 471 after 1km and follow road. Ichinose Yamanokami is on the left side. 志賀高原 焼額山 about 32km + about 9km Turn left onto Prefecture Road 471 after 1km and follow road. Yakebitaiyama is on the left side. 志賀高原 渋峠 about 36.5km + about 13.5km* Follow Route 292. During winter the only way to get to Shibutoge is via the Yokoteyama ski lifts. 志賀高原 奥志賀高原 about 44km + about 11km (Gondola) Turn left onto Prefecture Road 471 after 1km and follow the road. Okushiga Kogen is on the left side. Take Route 292 back down the mountain towards Nagano and Nakano. Follow Route 292 for about 19km until reaching a turn off for Iiyama - be sure to keep to the left side; 150m later there's a turn to the right towards Iiyama and Tokamachi. This road is actually a continuation of Route 292. Follow Route 292 for another 9km until reaching the Route 117 junction - the signpost mentions Tokamachi and Nozawa Onsen. Turn right here and continue for about 3km until reaching a sign for Madarao. Turn left at the sign and then right again after about 450m. Cross over the train line and then turn left onto Prefecture Road 97. Follow this road and the signposts up to the Madarao area. Take Route 292 back down the mountain towards Nagano and Nakano. Follow Route 292 for about 19km until reaching the options of either staying straight ahead for Nagano or keeping to the left for Iiyama, Suzaka and Obuse. Straight ahead is a 4km or so toll road (310 yen normally, currently offering discounts at certain times) that goes directly to the Shinshu Nakano IC exit/entrance of the Joshinetsu Expressway. This toll road can be avoided by keeping to the left and then turning left towards Suzaka and Obuse at the traffic lights and then right again less than 1km later - that road also arrives at the Shinshu Nakano IC. Either join the Joshinetsu Expressway and exit at either the Suzaka Nagano IC or Nagano IC, or continue straight on and head towards central Nagano using Route 117 and Route 18. Take Route 292 back down the mountain towards Nagano and Nakano. Follow Route 292 for about 19km until reaching a turn off for Iiyama - be sure to keep to the left side; 150m later there's a turn to the right towards Iiyama and Tokamachi. This road is actually a continuation of Route 292. Follow Route 292 for another 9km until reaching the Route 117 junction - the signpost mentions Tokamachi and Nozawa Onsen. Continue on Route 117 for about 11km until reaching a sign for Nozawa Onsen. Turn right here onto Prefecture Road 410. After 1km turn left onto Prefecture Road 38 which takes you into Nozawa Onsen village. The resort car parks are clearly signposted on approaching the village. Take Route 292 back down the mountain towards Nagano and Nakano. Follow Route 292 for about 19km until you reach the options of either staying straight ahead for Nagano or keeping to the left for Iiyama, Suzaka and Obuse. Straight ahead is a 4km or so toll road (310 yen normally, currently offering discounts at certain times) that goes directly to the Shinshu Nakano IC exit/entrance of the Joshinetsu Expressway. This toll road can be avoided by keeping to the left and then turning left towards Suzaka and Obuse at the traffic lights and then right again less than 1km later - that road also arrives at the Shinshu Nakano IC. Join the Joshinetsu Expressway and head north for about 27km, exiting at Myoko Kogen IC. Take Route 292 back down the mountain towards Nagano and Nakano. Follow Route 292 for about 19km until reaching a turn off signposted as Iiyama, Suzaka and Obuse - be sure to keep to the left side here as soon there is another junction. At the junction take Route 403 heading towards Suzaka and Obuse. Continue through Obuse (a good place to stop and take a walk round) and then get onto Route 406 which goes up to Sugadaira which is generally well signposted. Alternatively you can take the Joshinetsu Expressway from Shinshu Nakano to Suzaka Nagano Higashi, but the normal roads are more direct and usually fine. Take Route 292 back down the mountain towards Nagano and Nakano. Follow Route 292 for about 19km until you reach the options of either staying straight ahead for Nagano or keeping to the left for Iiyama, Suzaka and Obuse. Straight ahead is a 4km or so toll road (310 yen normally, currently offering discounts at certain times) that goes directly to the Shinshu Nakano IC exit/entrance of the Joshinetsu Expressway. This toll road can be avoided by keeping to the left and then turning left towards Suzaka and Obuse at the traffic lights and then right again less than 1km later - that road also arrives at the Shinshu Nakano IC. Join the Joshinetsu Expressway and exit at Nagano IC. At the Nagano IC exit, turn right onto Prefecture Road 35 for just under 3.5km heading towards central Nagano City. At the Route 19 (Nagano Minami Bypass) junction, turn left - Hakuba is signposted. After about 13.5km on Route 19 turn right onto the Hakuba Nagano Toll Road (210 yen) and from there Prefecture Roads 31 and 33 continue straight into Hakuba. Take Route 292 back down the mountain towards Nagano and Nakano. Follow Route 292 for about 19km until reaching a turn off for Iiyama - be sure to keep to the left side; 150m later there's a turn to the right towards Iiyama and Tokamachi. This road is actually a continuation of Route 292. Follow Route 292 for another 9km until reaching the Route 117 junction - the signpost mentions Tokamachi and Nozawa Onsen. Continue on Route 117 for about 46.5km, going past Nozawa Onsen and through Sakae Village and Tsunan Town. After passing through Tsunan, turn right on Route 353 which is signposted as Shiozawa and Route 17. Continue on Route 353 for about 18km until reaching Route 17. From this junction turn right to head into Yuzawa town. (Turn left for some of the resorts in Minamiuonuma). For detailed information on how to get to Shiga Kogen by train and public transport, please go to this section.